Bartlesville baseball came away from its vacation with some hardware. 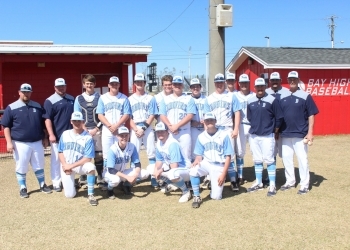 BHS won the Panama City Invitational Tournament on Thursday afternoon with another victory. BHS knocked out White House-Heritage, 3-0, to win its fourth straight game in its annual spring break trip to Florida. This is the second shutout performance of the week for the Bruins. Bryce Weathers went the first five innings on the bump. Weathers gave up six hits and struck out four. Harold Borg earned the save as he retired all six batters he faced in two innings of relief. The top of the Bartlesville order was dominant on the offensive side. Each hitter in the top four of the lineup had two base hits apiece. Braden Winters stretched the Bruin lead to 2-0 after a fifth inning double. Winters would later score a seventh inning RBI single from Calvin Johnson. Bartlesville is 5-7 on the season. The Bruins will return home on Monday for a game against Union.